The good thing about the RNC’s childish effort at strategery is that they have nowhere to go but up this year. They’ve started in the sewer. Things have to get better, I think. The slurs and insults were just a little bit of internal marketing, but they did attract attention after Ben Smith broke the story in Politico. I don’t get why calling Harry Reid “Scooby Doo” is an insult exactly. 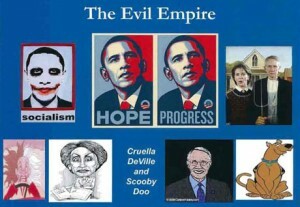 The Cruella de Vil slur is right out front… Nancy Pelosi, puppy-killer. Of course the real fear and trembling in RNC circles is caused by socialism. Heath Ledger as the Joker was… wait, he actually wasn’t a socialist was he? More a mad man, a creep in clown’s clothing, sort of a Glenn Beck kind of guy. This kind of strategy is nothing new: scare the bejaysus out of the mark and squeeze him for every nickel he’s got. Kind of bold to actually write it down in black and white… a bit brazen to admit that you have to lie to your donors to raise money. The seventy-two page PowerPoint presentation contains a lot of good information beyond the silly insults. for example, the confirmed calendar of fund raising events on page 47 shows an event called “Young Eagles at US Training Center, Moyock, NC.” That would be the Blackwater (aka Xe) Training Center. Since the schedule was revealed, Blackwater and the Republicans have both been quick to issue denials. The alliance is a PR nightmare. The Republican Eaglets have been challenged to raise $60,000 at the event. Back around page 70 they begin to gloat a little about their Supreme Court and its flawed Citizens United decision. Read the whole thing. It’s an eye-opener. On 9/11 the Young Eagles have scheduled a Texas bird hunt. I’m betting that quick draw Cheney hasn’t been invited. That link ain’t working, Frank … the Apture Scribd .swf loads but throws an exception ‘Document failed to convert’. It looks to be a good read – for all the wrong reasons, of course.